Welcome to the agent round of Pitch Live! The following entries have made it through the first round and are in the following posts after this one. Please no comments other than those from agents. If you want to comment on the entries please go to this post here and click on each participants’ link. 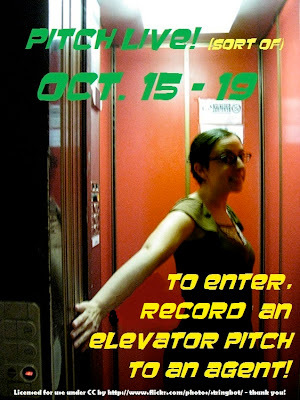 From today, October 17 – October 19 the agents will hop around and request pages from their favorite pitches. Check out all the agents viewing the pitches on this post here. Submissions: Should you get a request from one of the agents, go to their websites and follow their submission guidelines. In your submission, make sure to put this in the subject line: Pitch Live Requested Material: TITLE OF YOUR NOVEL. Unless, of course, the agent puts specific instructions in the comments of your posts. We had a vote going for the best video during the blogfest part of the contest, so we’ll announce the winners now. Winners please send an email to brendadrakecontests@gmail.com to claim your prize. Good luck to everyone and thanks to the agents for stopping by! I sincerely appreciate your shoutout on Twitter for my Pitch Live. I just noticed it, or I would have thanked you sooner. Thank you for the opportunity for such a creative pitch. I wished my spirits would have matched my true feelings about my book, but it couldn’t be helped. Again, thank you. I’m glad I got to participate! Very cool idea! So glad I found your blog. I look forward to visiting again. Would 70,000 words for a YA fantasy to low? That word count is fine. You do have some room to work with if your world isn’t build enough. With fantasy you can go up to 90K, sometimes more. I try to stay 80K – 90K. Ask yourself: Is your world and characters fleshed out enough? Is there clarity through out? If so, then you’re good. I think I did fairly well with my world building, but with 10,000 or so words to work with, I may be able to add some color if suggested by an editor. Thanks for letting me know. I wondered about my word count because I have been told 70,000 was a tad bit low for a fantasy.